The next morning 7 young men, including the one who threw the stone, came and escorted us back to Chabin. They moved trees, branches and rocks that were on the roads as part of the countrywide protests. That day those young men worked with us as we built a kitchen for the church. That night we invited them to dinner with us. We could extend grace and forgiveness to those young, frustrated men. We listened to their stories. The rock had nothing to do with us, but God used it. Also, because of the protests and our team going back after the roadblock, we had deeper conversations and connections than we’ve ever had before with our friends there. We learned that things in Haiti and in Chabin are even more difficult than we knew. I believe God is using Evergreen to “preserve many people alive” - with food, education, encouragement and by seeing and hearing the Gospel of Jesus demonstrated to them consistently. 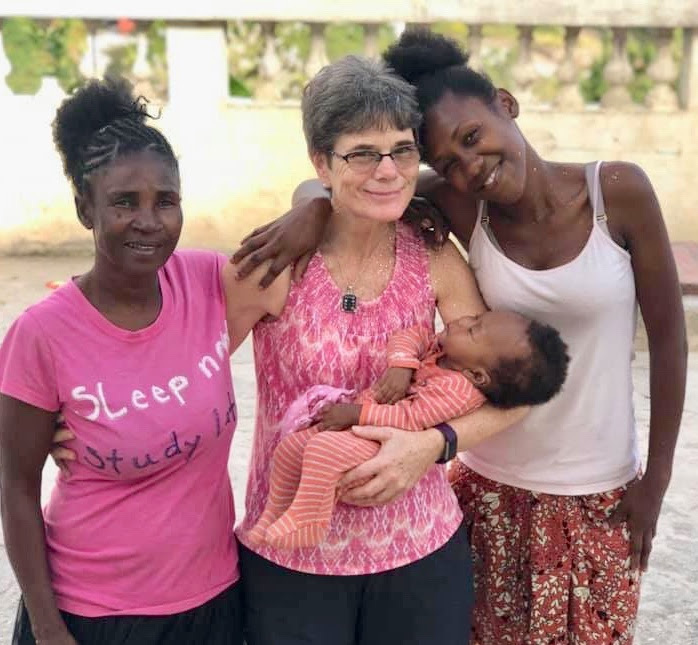 I was proud to be a part of this team and to be a part of what Evergreen is doing in Haiti. visit the Global Project Goals in our Project Guide. And it's not too late to make your pledge for 2019! Nur Nabi is Free and Safe! Our brother, Nur Nabi, is now free, and safe! God has heard your prayers!!! He had been blindfolded, taken to a room somewhere, and held for two days, with no food, only water. They challenged him, "You have changed your religion, and now you are influencing others." They kept asking him for information. Finally they threatened him, "Don't let us see you in Sirajgunj again..." and left him blindfolded on the road. He overheard them say they were taking Mamun to the Manikganj district, near Dhakka, but that is all we know of his whereabouts. They let Nur Nabi go because Mamun was their target. Please continue to pray for Mamun's release. Jesus said, "I have told you these things so that in me you may have peace. You will have suffering in this world. Be courageous! I have conquered the world." Mamun Has Also Been Released! I just received word that Mamun has been set free by his abductors. This is a miracle that God has worked through your prayers!!! I was told his abductors had beaten him, but he kept sharing to them from the Quran, chapter 4, that those who follow Isa al Masih (Jesus) will gain eternal life. (Chapter 4 also teaches that Mary was chosen by God to bear the Christ child, that His birth was announced by angels, and that Jesus performed many miracles). His kidnappers threatened that if he continues to preach the gospel, they will kill him. After keeping him in seclusion with no food for more than three days, they let him go! Thank you all for praying! Prayer works because God listens! Thank you for standing with us in the battle. Su and I have trained three networks of churches in Bangladesh in the last nine days. They responded enthusiastically and set goals to start many more groups. Our ministry is expanding rapidly and we anticipate great results in terms of souls saved and churches started. We will fly to Kathmandu on Monday to strengthen five teams there and help them become more fruitful. We need your prayers! 1. Pray for Mamun and Nur Nabi to recover completely from the trauma. 2. Pray for their wives and children. 3. Pray for their captors to be saved. Yesterday ten men stormed into a church and kidnapped two gospel workers in our network, Mamun, and Nur Nabi. Mamun has the long black beard in the photo above. He used to be a Muslim and Quran teacher in a Madrasa. After he put his faith in Jesus Christ he left the Madrasa to preach the gospel. He has been leading eight training groups. Yesterday morning, he and Nur Nabi were teaching in church when ten helmeted men stormed in and took them. We do not know their whereabouts or condition. This happened in Bogra, Bangladesh, just 4 hours away from where Su and I are now. We are praying and ready to do whatever we can to help them and their families. 3. Pray for their captors. This was the message that was shared at Evergreen Lakeville on January 13, 2019. It is a high level summary of ways we believe God is asking us to build his Kingdom in 2019.